This particular plant is widely known as the “common reed,” but the havoc it is causing on wetlands in various parts of the United States is anything but, which is why it definitely makes our list of the worst water weeds. In the world of scientific botany, the genus is known as Phragmites, with four main species found in different parts of the world. Only one of those four species, however, is the one causing major headaches around the country. It is also on the list of Invasive and Exotic Aquatic Plantsmaintained by the Center for Invasive Species and Ecosystem Health. Here’s what you need to know about Phragmites. Origins: This is where things get a little tricky with Phragmites. As it turns out, there isa subspecies, Phragmites americanus, that is native to North America, meaning it is not exotic nor is it invasive. But Phragmites australisis very much both exotic and highly invasive. Its origins are in Europe, but it made its way to North American sometime in the late 1700s or early 1800s, probably in the ballast of sailing vessels. 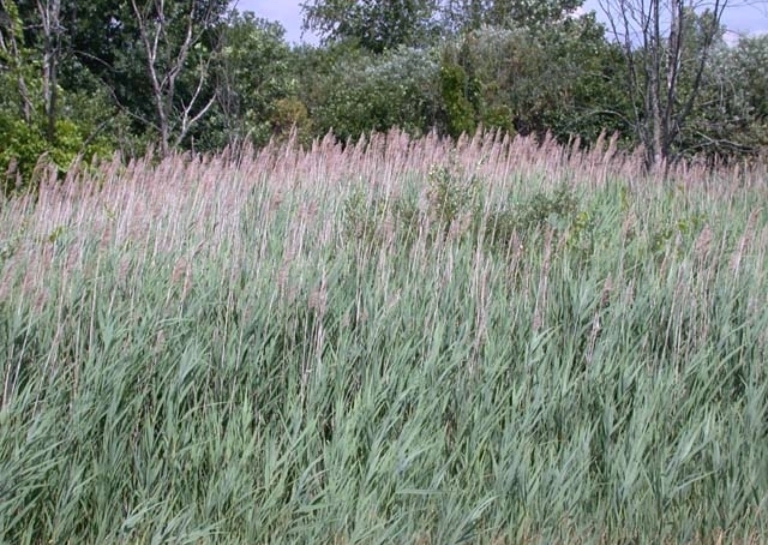 Habitats: Phragmites australisis a perennial grass that can grow in damp ground, marshes and other wetlands with standing water up to a height of 3 feet, although it has also been seen to form floating mats that launch out over deeper waters. It can spread very quickly by way of rhizomes (horizontal runners) at a rate of up to 16 feet per year. The height of this plant’s woody, hollow stems typically ranges between 6-15 feet, although some have been known to reach heights of nearly 20 feet. Its leaves are thin, flat and yellow, growing in an alternate pattern along the stem and are usually 1-1.5” in width, taper towards the end, and can grow to over a foot in length. When Phragmites australisis firmly established, its more extensive stands can cover areas as large as 250 acres. It can also spread by means of windblown seeds, soil transfer and animals. It is highly adaptable to environmental conditions and can survive even insurvive stagnant, oxygen poor or salty conditions. And as you can see in the map below, there are few places in the US where you won’tfind Phragmites. Eco-Impacts: Phragmitesaustralisrobs native species of plants and fish of nutrients and space. The dense thickets can also make recreational endeavors such as swimming and fishing completely impossible, not to mention totally obscuring shoreline views. These plants can also be considered a significant fire hazard. Thick stands of Phragmites australis (sometimes with well over 20 stalks per square foot) displace native plants, alter hydrology and block sunlight to the aquatic community. It’s a little painful for us to see people struggling to remove Phragmitesby hand because it’s a real bugger! Phragmitesremoval for a well-established stand often takes a solid commitment over two or three growing seasons (yes, that means 2-3 years) because of its tenacity. 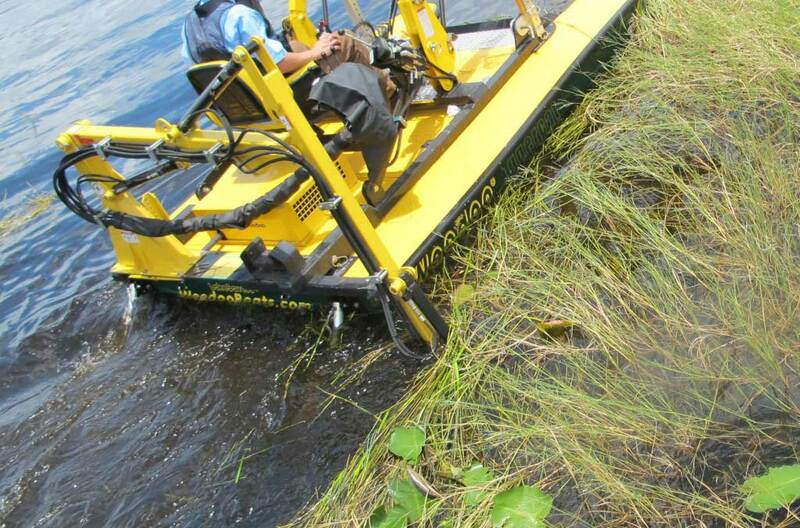 The job is a whole lot easier, though, when you have the right tools, like and Weedo Work Boat. Our TC Series Compact Workboat would be a great choice for this kind of project. 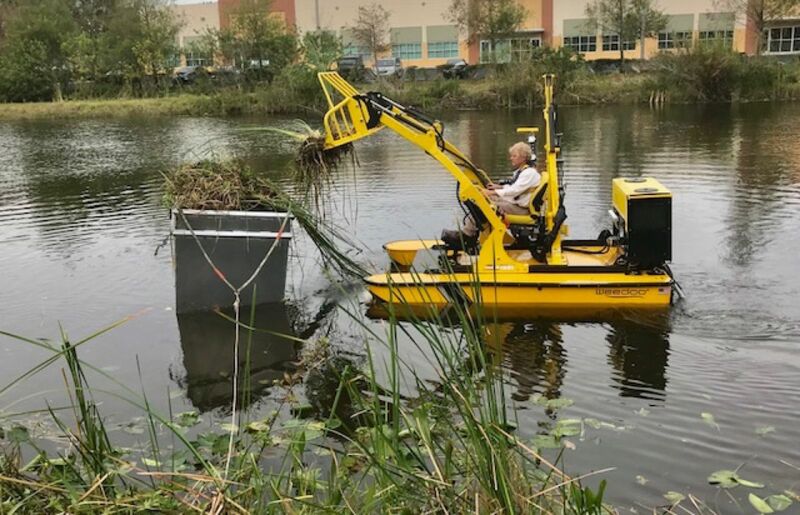 The Fiberglass/Kevlar hull configuration includes a deck-mounted marine boom cutter ideal for Phragmitesremoval, a front-end loader with universal marine bucket system, and a T-1305 highway transportation trailer. The factory-installed power platform features a Kubota D902 3-cylinder liquid-cooled engine with electric start and alternator. Cyclonic hydraulic system provides eco-friendly fluid to high-efficiency triple pump setup producing 27 GPM. 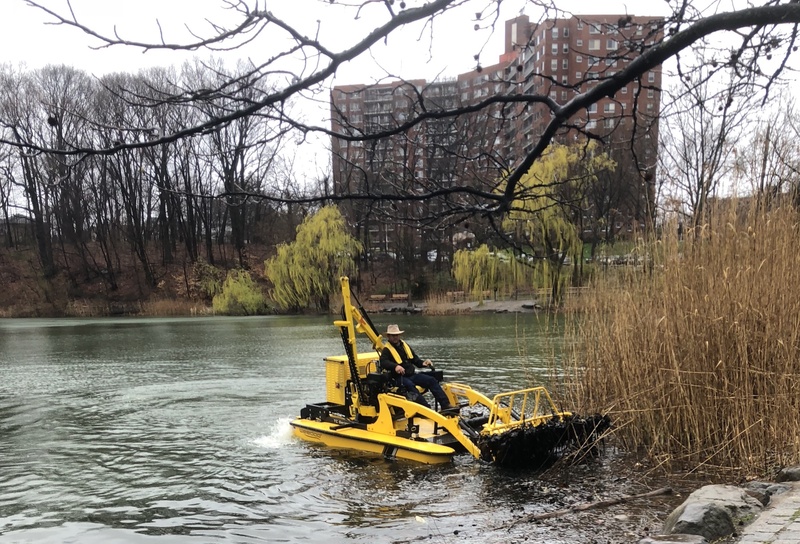 System includes twin propulsion outdrives with Weedoo Weed-N-Mud propellers and quick-change hydraulics for aquatic work attachments. Ready to tackle those wily water weeds without chemicals? Contact Weedoo today! Wintertime Water Ecosystems: Spring into Action Now to Beat Water Weeds! 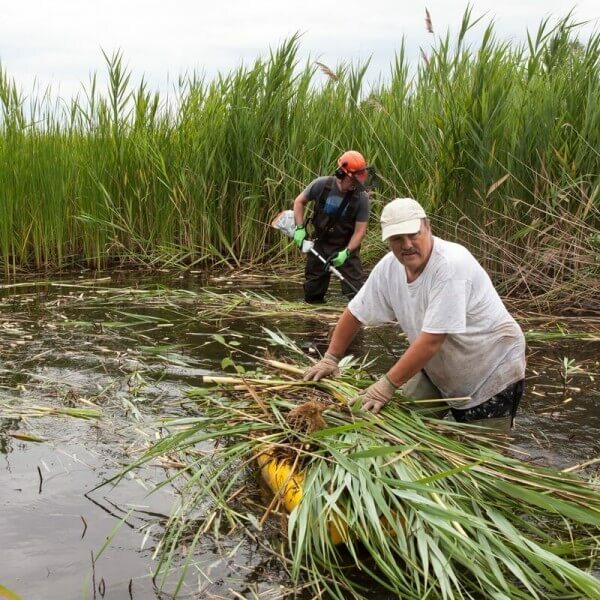 Phragmites is widely known as the “common reed,” but the havoc it is causing on wetlands in various parts of the United States is anything but, which is why it definitely makes our list of the worst water weeds.